"A great longing to be like them"
For the Solemnity of All Saints, here is a homily given by Benedict XVI on November 1, 2006. Our Eucharistic celebration began with the exhortation: "Let us all rejoice in the Lord." 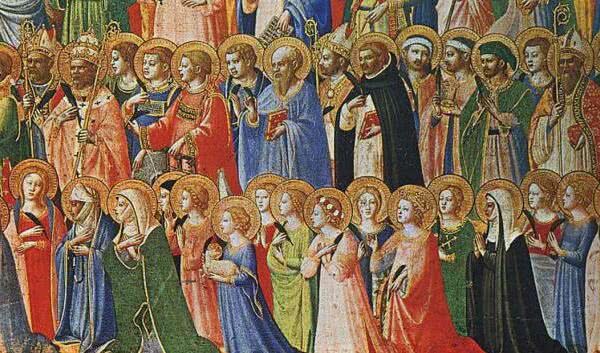 The liturgy invites us to share in the heavenly jubilation of the Saints, to taste their joy. The Saints are not a small caste of chosen souls but an innumerable crowd to which the liturgy urges us to raise our eyes. 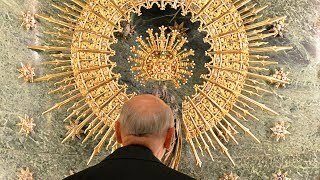 This multitude not only includes the officially recognized Saints, but the baptized of every epoch and nation who sought to carry out the divine will faithfully and lovingly. We are unacquainted with the faces and even the names of many of them, but with the eyes of faith we see them shine in God's firmament like glorious stars. Today, the Church is celebrating her dignity as "Mother of the Saints, an image of the Eternal City" (A. Manzoni), and displays her beauty as the immaculate Bride of Christ, source and model of all holiness. She certainly does not lack contentious or even rebellious children, but it is in the Saints that she recognizes her characteristic features and precisely in them savours her deepest joy. In the first reading, the author of the Book of Revelation describes them as "a great multitude which no man could number, from every nation, from all tribes and peoples and tongues" (Rev 7:9). This people includes the Saints of the Old Testament, starting with the righteous Abel and the faithful Patriarch, Abraham, those of the New Testament, the numerous early Christian Martyrs and the Blesseds and Saints of later centuries, to the witnesses of Christ in this epoch of ours. They are all brought together by the common desire to incarnate the Gospel in their lives under the impulse of the Holy Spirit, the life-giving spirit of the People of God. But "why should our praise and glorification, or even the celebration of this Solemnity, mean anything to the Saints?" A famous homily of St Bernard for All Saints' Day begins with this question. It could equally well be asked today. And the response the Saint offers us is also timely: "The Saints", he says, "have no need of honour from us; neither does our devotion add the slightest thing to what is theirs.... But I tell you, when I think of them, I feel myself inflamed by a tremendous yearning" (Disc. 2, Opera Omnia Cisterc. 5, 364ff). This, then, is the meaning of today's Solemnity: looking at the shining example of the Saints to reawaken within us the great longing to be like them; happy to live near God, in his light, in the great family of God's friends. Being a Saint means living close to God, to live in his family. And this is the vocation of us all, vigorously reaffirmed by the Second Vatican Council and solemnly proposed today for our attention. But how can we become holy, friends of God? We can first give a negative answer to this question: to be a Saint requires neither extraordinary actions or works nor the possession of exceptional charisms. Then comes the positive reply: it is necessary first of all to listen to Jesus and then to follow him without losing heart when faced by difficulties. "If anyone serves me," he warns us, "he must follow me; and where I am, there shall my servant be also; if any one serves me, the Father will honour him" (Jn 12: 26). Like the grain of wheat buried in the earth, those who trust him and love him sincerely accept dying to themselves. Indeed, he knows that whoever seeks to keep his life for himself loses it, and whoever gives himself, loses himself, and in this very way finds life (cf. Jn 12: 24-25). The Church's experience shows that every form of holiness, even if it follows different paths, always passes through the Way of the Cross, the way of self-denial. The Saints' biographies describe men and women who, docile to the divine plan, sometimes faced unspeakable trials and suffering, persecution and martyrdom. They persevered in their commitment: "they... have come out of the great tribulation," one reads in Revelation, "they have washed their robes and made them white in the blood of the Lamb" (Rev 7: 14). Their names are written in the book of life (cf. Rev 20: 12) and Heaven is their eternal dwelling-place. The example of the Saints encourages us to follow in their same footsteps and to experience the joy of those who trust in God, for the one true cause of sorrow and unhappiness for men and women is to live far from him. Holiness demands a constant effort, but it is possible for everyone because, rather than a human effort, it is first and foremost a gift of God, thrice Holy (cf. Is 6: 3). In the second reading, the Apostle John remarks: "See what love the Father has given us, that we should be called children of God; and so we are" (I Jn 3: 1). It is God, therefore, who loved us first and made us his adoptive sons in Jesus. Everything in our lives is a gift of his love: how can we be indifferent before such a great mystery? How can we not respond to the Heavenly Father's love by living as grateful children? In Christ, he gave us the gift of his entire self and calls us to a personal and profound relationship with him. Consequently, the more we imitate Jesus and remain united to him the more we enter into the mystery of his divine holiness. We discover that he loves us infinitely, and this prompts us in turn to love our brethren. Loving always entails an act of self-denial, "losing ourselves," and it is precisely this that makes us happy. Thus, we have come to the Gospel of this feast, the proclamation of the Beatitudes which we have just heard resound in this Basilica. Jesus says: Blessed are the poor in spirit, blessed those who mourn, the meek; blessed those who hunger and thirst for justice, the merciful; blessed the pure in heart, the peacemakers, the persecuted for the sake of justice (cf. Mt 5: 3-10). In truth, the blessed par excellence is only Jesus. He is, in fact, the true poor in spirit, the one afflicted, the meek one, the one hungering and thirsting for justice, the merciful, the pure of heart, the peacemaker. He is the one persecuted for the sake of justice. The Beatitudes show us the spiritual features of Jesus and thus express his mystery, the mystery of his death and Resurrection, of his passion and of the joy of his Resurrection. This mystery, which is the mystery of true blessedness, invites us to follow Jesus and thus to walk toward it. To the extent that we accept his proposal and set out to follow him -- each one in our own circumstances -- we too can participate in his blessedness. With him, the impossible becomes possible and even a camel can pass through the eye of a needle (cf. Mk 10: 25); with his help, only with his help, can we become perfect as the Heavenly Father is perfect (cf. Mt 5: 48). Dear brothers and sisters, we are now entering the heart of the Eucharistic celebration that encourages and nourishes holiness. In a little while, Christ will make himself present in the most exalted way, Christ the true Vine to whom the faithful on earth and the Saints in Heaven are united like branches. Thus, the communion of the pilgrim Church in the world with the Church triumphant in glory will increase. In the Preface we will proclaim that the Saints are friends and models of life for us. Let us invoke them so that they may help us to imitate them and strive to respond generously, as they did, to the divine call. In particular, let us invoke Mary, Mother of the Lord and mirror of all holiness. May she, the All Holy, make us faithful disciples of her Son Jesus Christ! Amen.